April 1, 2015  Food producers are thinking big by going itty-bitty with tiny fruits and vegetables that aim to tempt young palates. 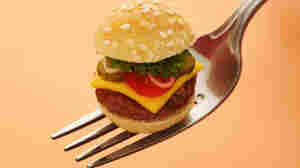 Doll-sized burgers and sweets also offer dieters the ultimate in portion control. April 1, 2015  Leona Chin stalled her high-powered car in first gear and randomly turned the wipers on — before unleashing the skills she has honed as a professional driver. Havoc, and some panic, ensued. April 1, 2013  Google Nose lets you sniff "15M+ sentibytes" via your computer screen. Twttr is for those who only want to use consonants. YouTube closes until 2023 because it has enough videos already. Morning Edition profiles "Hootie and the Time Travelers." The foolishness has begun. April 1, 2011  Welcome to April Fools' Day in the Internet age! Ever since last year's April 1st, when Google changed its name to Topeka for the day, I have been anxiously awaiting this year, to see what kind of shenanigans the web's most popular sites would pull. April 1, 2011  The joke's on you if you forgot that it's April 1. April Fools' jokes are popping up again. April 1, 2008  April is the cruelest month.